Twitter confounded expectations last quarter when it reported healthy revenue and good user growth numbers; now all eyes will be on its Q3 earnings later today to see if they repeat the beat. But as the social network continues to build out its business as a platform — as a medium not just for people to Tweet about their annoying commute to work, but as a place for people to discover and click through to other content, things to buy, and share links with other people — research published by Shareaholic sheds light on how it may face another challenge in doing this. 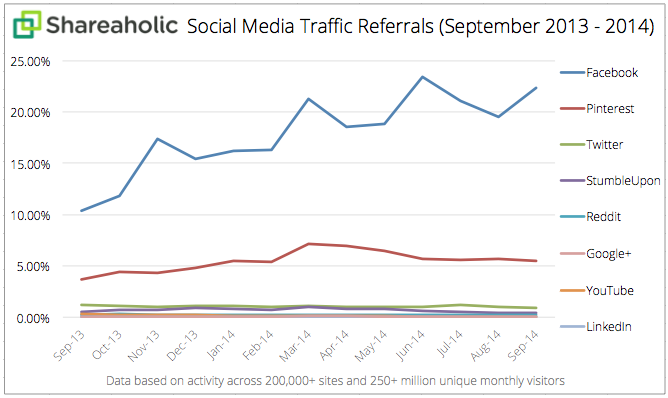 Twitter’s share of traffic referrals compared to other social media sites is declining. According to figures from the Boston-based firm, Facebook is currently pulling in just over 22%, or just over one-fifth, of all social-based traffic referrals and has seen its traffic grow by almost 116% in the last year, making it the undisputed traffic referral king. In a firm, but distant, second position is Pinterest, which accounted for 5.5% of all referral traffic last month, rising about 50% in the last year. Twitter, meanwhile, is at an even more distant number three. It is currently at less than one percent (0.88% to be exact) of all social referral traffic, with its share down 25% compared to a year ago. Shareaholic says it bases its numbers on analysis of over 200,000 websites covering 250 million unique monthly visitors. Beyond Twitter, the social referral numbers get even more minor for StumbleUpon, Reddit, Google+, YouTube and LinkedIn — the networking site for professionals that has gone to lengths position itself as a place for people to publish and share news. Turning that predicament around, there is also still a lot of room for movement and growth. Collectively, traffic from the top eight sites drove only 29.49% of overall traffic across the sites that Shareaholic analysed — effectively spreading the remaining 70% across a very long tail of other properties. Last year the top eight generated 16.44% of referral traffic, so some rapid consolidation is clearly underway. Looking at Shareaholic’s data, Twitter’s performance on the one hand is a product of a wider trend. The big get bigger, and the rest will fall as a result. In this case, Facebook is the biggie: Shareaholic’s Danny Wong tells me that in the entire time that the company has been measuring social referral traffic, Facebook has never not been in first position, and over time, as Facebook has picked up more users, and has played with its algorithms for surfacing news and introduced video and other formats, it has only grown its percentage. In fact, besides Facebook and Pinterest, the only other social network in the top eight that saw growth over the last year was Google+, up 57%, albeit from a tiny base, 0.07% of all social media referrals. Some allege that Google has been pushing Google+ in search results ahead of other sites; if that is actually the case, this could be part of the reason why Google+ has grown. On the other hand, Twitter’s decline is a comment on the efforts Twitter has made to highlight its position as a media platform. Despite instances like this one from the Guardian claiming that Twitter drives more breaking news traffic to the Guardian than other social networks, Shareaholic’s numbers seem to imply that this may be the exception, or the case for a small number of users, rather than the norm. It’s also interesting in the context of Twitter’s latest expansions to more mobile services by way of its Fabric SDK unveiled last week. One other thing worth pointing out in Shareaholic’s figures is how that Pinterest’s impact appears to be similar to Facebook’s and proportionate to its size. Pinterest has not disclosed its most recent user numbers so we cannot compare these with Facebook’s, but figures from comScore note Pinterest had nearly 30 million monthly visitors in September 2014, compared to over 132 million to Facebook. Just as Pinterest has around a quarter of the traffic of the bigger social network, so too does it have around one-quarter of social shares. As a point of comparison, comScore put Twitter’s monthly users at around 36 million for the same month. Taking the progress of just the most recent quarter, where Shareaholic analysed traffic from over 300,000 sites, Google+ was only one of two risers, the other being LinkedIn. Wong notes that almost ubiquitous sequential declines are almost certainly seasonal more than anything else with traffic in general being slower in summer months.